Sweating is good for health while researchers have found that a sauna does more than sweating. It can be a lifesaver, they say. Middle-aged men who take frequent saunas are less likely to die from heart conditions than those who do not, scientists have found. Those who visited saunas most often experienced the greatest benefits of it. 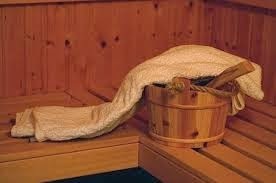 Even compared with men who took one sauna a week, their risk of dying from cardiovascular disease was 50% lower. The study was conducted among 2,315 men aged 42 to 60 from eastern Finland, where there is a strong sauna tradition. Researchers followed their progress for 21 years comparing death rates between those who went to the sauna once a week and others who made more visits that are frequent. The research, led by Jari Laukkanen, from the University of Eastern Finland at Kuopio, reported online in the journal Jama Internal Medicine. We can make our own sauna type bath with steamy rooms so that we live more.